There’s no prep work necessary! 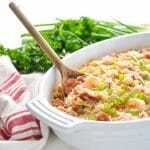 Just stir the raw ingredients together in a dish and pop it in the oven for an easy Dump-and-Bake Jambalaya. 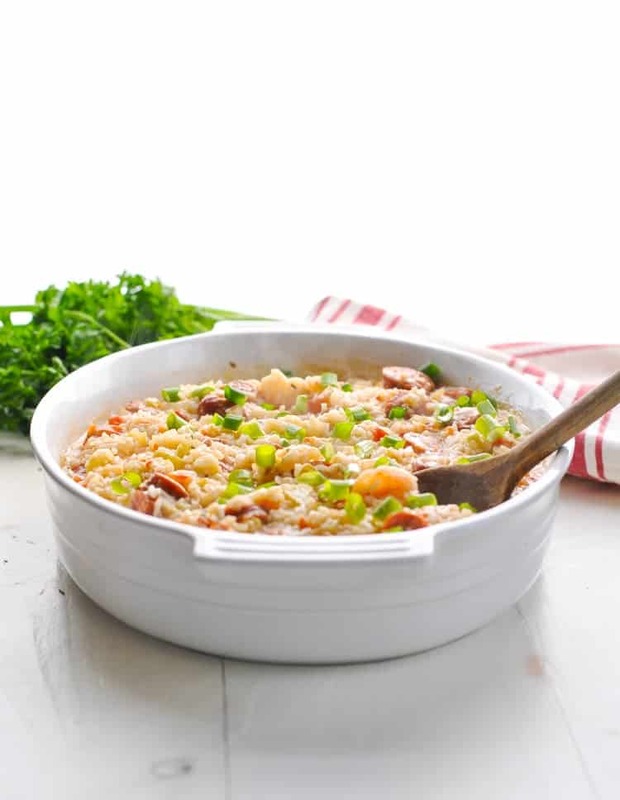 This Cajun-inspired meal is full of Andouille sausage, shrimp, rice and veggies for a taste of the South — even on your busiest weeknights! This has got to be the World’s Easiest Jambalaya, and after one bite you’ll never try another recipe again! The rice bakes in the oven, along with the “Holy Trinity” of celery, onion, and bell pepper, plus plenty of Creole spices and garlic. As the rice cooks and releases its starches, you get a thick, creamy, risotto-like dish that’s perfectly seasoned and zesty. There’s just so much flavor and texture in the one dish meal! 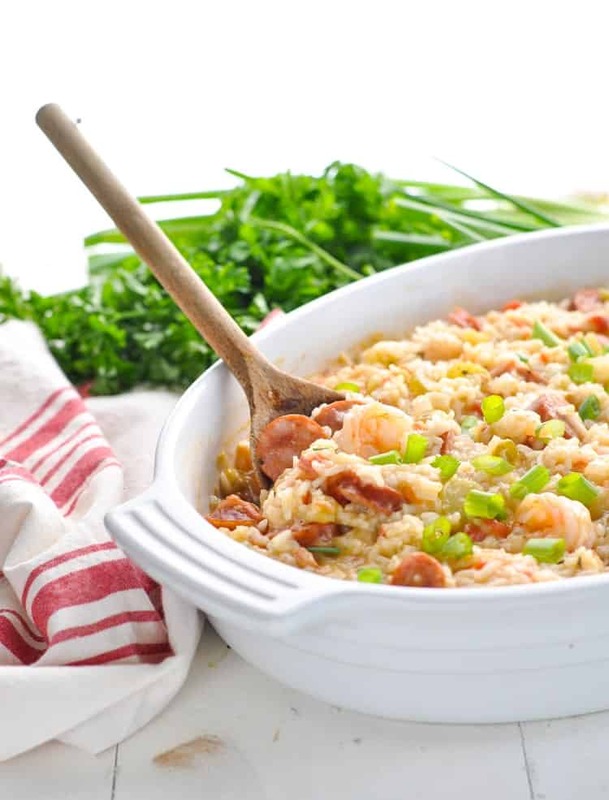 In order to keep the sausage and the shrimp from over-cooking, you’ll just stir them into the jambalaya during the final few minutes of baking. This hearty, cozy, and (most-importantly) EASY dinner is something that the entire family can agree on. Just adjust the amount of Cajun seasoning to keep it mild — or to amp up the heat — depending on your preference. I’ve been serving this low-country specialty for as long as I can remember, and every single one of my babies has loved it. It’s truly a keeper! In the prepared dish, whisk together first 12 ingredients (water through oregano). Stir in sausage and shrimp. Cover and bake for an additional 20-25 minutes, or until rice is tender and most of the liquid is absorbed. Give it a good stir, and garnish with green onions just before serving. Cooking for a Smaller Family? You can cut all of the ingredients in half and bake the Jambalaya in an 8-inch square pan. Tip: If you just need small quantities of the vegetables (like celery and bell pepper), you can purchase these vegetables pre-diced at your salad bar for an easy shortcut. And there's no waste or leftovers! I’ve never thought to make jambalaya like this before! I’m so intrigued, this looks delicious! What a great weeknight meal, so full of flavor! Hey, Jacquie! It just means the first 12 ingredients listed — from the water all of the way down the list to the oregano. So you’re mixing everything EXCEPT for the sausage, shrimp and green onions (which are added towards the end). Hope that makes sense! Sorry, recipe sounds delicious but still don’t understand your answer. What does water have to do with this recipe? Thanks. Hi, Beverly! Water is the first ingredient in the list. You need to include the water in the dish because the rice needs water in order to cook (the rice will absorb the liquid as it bakes). Does that clarify it for you? Just let me know if you have questions. Ooh, this looks so good! Because Jesse’s family is from Central Louisiana we make jambalaya a little differently (it’s super simple – no vegetables!) but I love adding extra ingredients to it so I’ll have to try this! I accidentally mixed in the sausage with the other ingredients is it going to hurt anything? This was delicious but the rice was not soft enough for my liking. Perhaps it should have cooked an additional 10 minutes or so before adding the shriimp and sausage. Any suggestions?